Pop'n Music (ポップンミュージック? ), most commonly shortened to Pop'n, PM or PNM, is a music video game in Konami's Bemani series. The game is notable for its bright colors, upbeat songs, and cute character graphics. 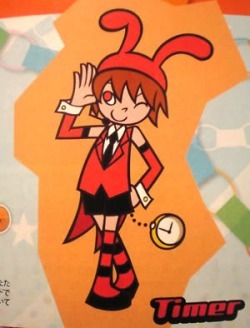 Although Pop'n Music was originally intended to be played by couples on dates, it has greatly escalated in difficulty since early iterations, and has since then attracted many players of beatmania and other Bemani games. Originally released in 1998, the game has had 15 home releases in Japan as well as many arcade versions. Unlike most of the Bemani series, the Pop'n Music controller is not designed to represent any real musical instrument. Instead it is a pattern of nine buttons in two rows; four on top and five on the bottom. On the screen colored notes called pop-kun (ポップ君) fall from the top to the bottom in nine rows corresponding to the buttons. When the notes reach the bottom the player presses the button and the game emits a note of the song, along with a judgement ranging from Great (hit the note perfectly on beat) (or Cool in Cho-challenge/Expert mode.) to Bad (missed the note completely and breaks a combo).